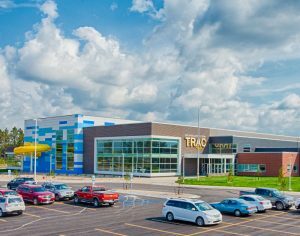 Aquatics at TRAC has something for everyone! Within our Activity Pool, Lesson Pool and Spa, we offer a variety of swimming programs including Water Aerobics, Lap Swim and Open Swim. Our 3 pools are all ADA compliant and guarded by a fully trained Lifeguard staff. 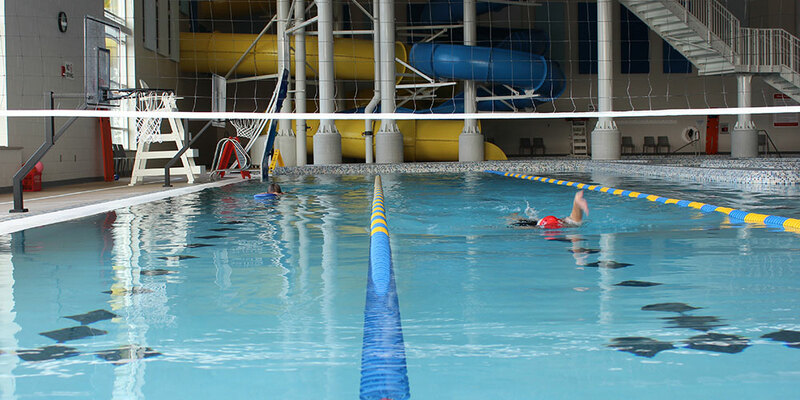 Adult learn-to-swim/coaching sessions are being offered! Class sizes are small to allow for individualized instruction. Click here to register online or stop by the TRAC front desk to enroll. Cost is $10/session for members and $15/session for non-members. Join us for Water Polo every Wednesday evening from 6:30 – 7:30pm. All ages welcome. Must be able to swim in the deep water as no flotation devices can be used. No registration needed, just show up and enjoy the fun! Our swim lesson program is designed to teach any age of child/adult how to swim. Check out our learn to swim program, we offer private and semi-private lessons all year and group lessons in the summer and periodically throughout the school year. Check out the hours our pool is open as we are not open the full hours of our facility. For the safety of all our guests we ask you review the rules of our space before you visit our pool. Zero depth entry play area including geysers, dump bucket, slide and playable water features. 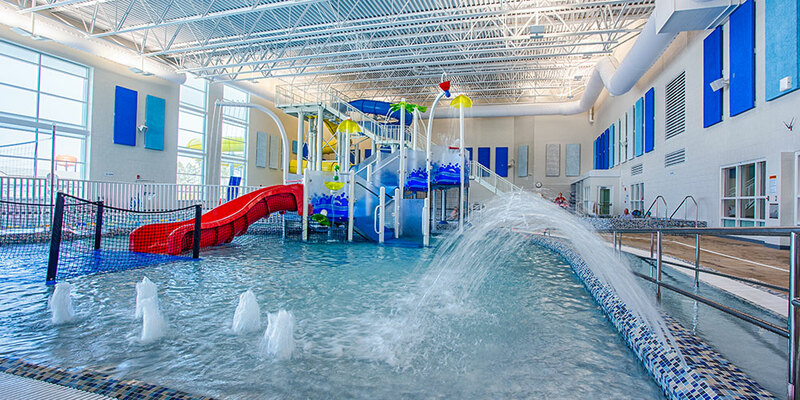 During classes (Swim Lessons, Water Aerobics or Aqua Zumba) the Play Structure will not be turned on. Zero depth entry ramp water wheelchair available upon request. 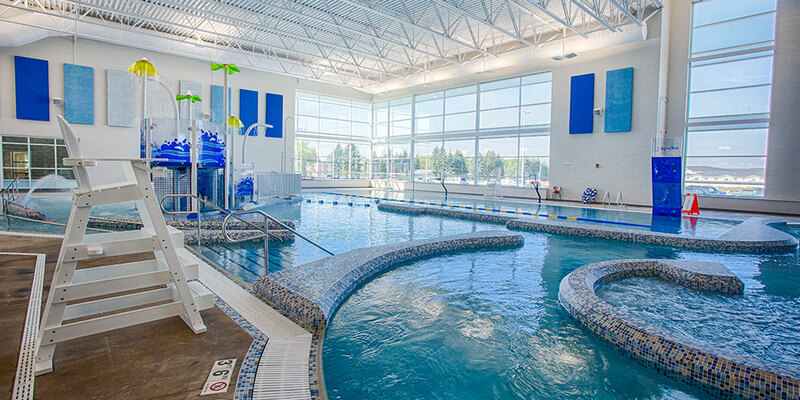 Three-lane lap pool can comfortably accommodate many swimmers using the circle-swim pattern. Lap lane length is 71ft or 23.66 yards or 21.64 meters. Climbing wall with deep water drop zone. 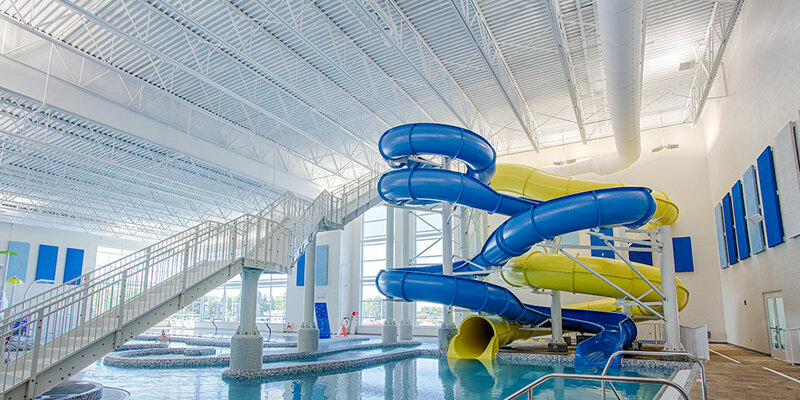 Two 40-foot slides, including the blue body slide and the yellow tube slide, which accommodates both single and double tubes. Slides are for use by all guests who are over 4 feet tall and able to swim. Shallow-stair entry with gentle slope to a maximum of 3.5 feet. Ideal for pre-school learn to swim program & others needing the warmer water. Accommodates up to 11 people. Co-ed sauna accommodates up to 22 people. Appropriate attire includes swim wear and light workout clothing. Layered clothing or using the sauna to cut weight is not permitted. Guests must be dry to enter sauna. During Lap Swim times, the 3 lap lanes are protected to allow for full utilization of the lap lane area. 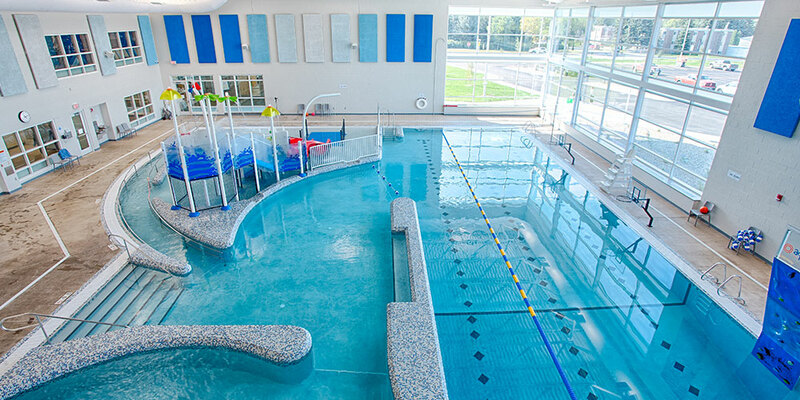 Other areas of the Activity Pool may be available for use during Lap Swim times. For all ages. Children 9 and over may use the pool unsupervised; 8 and under must be under direct adult supervision at all times. All areas of the pool open. See pool schedule for Big Slide times. For anyone over 48 inches (4 feet) tall and able to swim. Blue slide is a body slide. Yellow slide is a tube slide for 1- or 2-person tubes. Water aerobics uses the natural resistance and buoyancy of water to provide a wide variety of low-impact conditioning activities. Water exercise helps increase your energy, stamina and strength. Before starting an aerobics routine or class, check with your health care professional. Participants may bring and use their own water shoes and gloves. Suitable for all ages and fitness levels. Non-swimmers are welcome! Aqua Zumba is the perfect class for those looking for a low-impact, but high energy routine. The “Zumba Philosophy” is incorporated into the pool setting while the water resistance helps with toning. Whether you’re or an avid Zumbaholic, or just looking are looking for a change in your workout routine, you are sure to have a fun time in Aquazumba! We may need to restrict access to our pools for a variety of reasons. Scheduled closures will be communicated in advance using internal signage, social media and email newsletters and will always be as brief as possible. Unscheduled closures may be a result of an incident, equipment malfunction, weather, etc. We will do everything we can to communicate the closure as soon as possible, including when you can expect to have access again. Appropriate swim attire is required in all of our pools. This includes swim suits/trunks purchased from the swim department. All clothing worn in the pools must be made of a synthetic material such as polyester, lycra or nylon. COTTON is not allowed. This includes undergarments, t-shirts, shorts, etc. Guests are encouraged to bring their own US Coast Guard approved life jackets. Inflatables and floatation swimwear are not allowed. Life jackets are not allowed on the Big Water Slides or on Climbing Wall. Life jackets must be rinsed before entering the pool and are subject to lifeguard approval. Guests may bring their own dive toys. Inflatable or floating toys and balls of any type are not allowed. TRAC provides the following standards to childcare centers and daycare providers when using the pool. These standards are provided by the National Resource Center for Health and Safety in Child Care and Early Education. Constant and active supervision should be maintained when any child is in or around water (4). During any swimming/wading/water play activities where either an infant or a toddler is present, the ratio should always be one adult to one infant/toddler. The required ratio of adults to older children should be met without including the adults who are required for supervision of infants and/or toddlers. An adult should remain in direct physical contact with an infant at all times during swimming or water play (4). Whenever children thirteen months and up to five years of age are in or around water, the supervising adult should be within an arm’s length providing “touch supervision” (6). Touch supervision means keeping swimming children within arm’s reach and in sight at all times. The attention of an adult who is supervising children of any age should be focused on the child, and the adult should never be engaged in other distracting activities (4), such as talking on the telephone, socializing, or tending to chores. A lifeguard cannot be counted in the child:staff ratio. If you have questions about our Aquatics programs, please contact Aquatics Supervisor, Nici Flann at aquatics@jamestownparksandrec.com or 701-952-8796.